Idiotsitter TV show renewed for second season: image via Comedy Central. Comedy Central has renewed the scripted Idiotsitter TV show for a second season of ten episodes chock full of more idiocy. Idiotsitter season two will premiere in 2017. 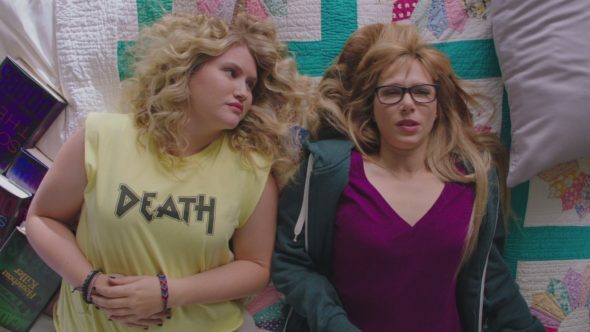 The Idiotsitter TV series is created and executive produced by and co-stars Jillian Bell and Charlotte Newhouse. Amy Slomovits, Dave Becky, Brady McKay and John Levenstein, also executive produce. Idiotsitter gets season two renewal from Comedy Central; photo credit: Comedy Central. NEW YORK, June 13, 2016 – Comedy Central’s favorite odd couple, Billie and Gene, return with more babysitting, bonding and binging as the #1 brand in comedy has renewed the scripted series “Idiotsitter” for a second season, it was announced today by Kent Alterman, President, Comedy Central. Created, executive produced and co-starring Jillian Bell and Charlotte Newhouse, and executive produced by Pam Kohl, Amy Slomovits, Dave Becky, Brady McKay and John Levenstein, the second season of “Idiotsitter” will premiere ten episodes in 2017. Viacom is home to premier global media brands that create compelling television programs, motion pictures, short-form video, apps, games, consumer products, social media and other entertainment content for audiences in 180 countries. Viacom’s media networks, including Nickelodeon, Comedy Central, MTV, VH1, Spike, BET, CMT, TV Land, Nick at Nite, Nick Jr., Channel 5 (UK), Logo, Nicktoons, TeenNick and Paramount Channel, reach over 3.5 billion cumulative television subscribers worldwide. Paramount Pictures is a major global producer and distributor of filmed entertainment. What do you think? Did you watch the first season of Comedy Central’s Idiot Sitter TV series? Do you plan to check out the second season? 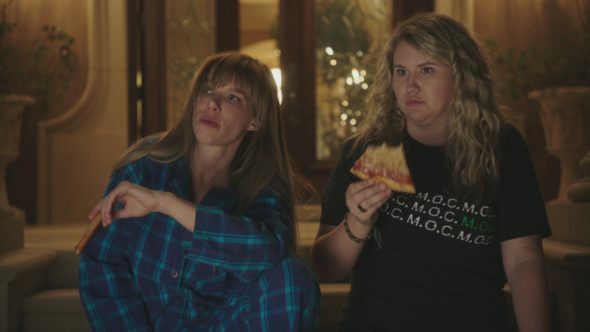 More about: Comedy Central TV shows: canceled or renewed?, Idiotsitter, Idiotsitter: canceled or renewed? Ok it cc, but it’s still worthless no matter who is staring in it. Congrats on the renewal… Surprising but I welcome it with open arms. I’ll definitely be watching S2!